Jordan Fillingham submitted this photo and caption. Our nation just celebrated the 200th birthday of Abraham Lincoln, so I thought it was appropriate to share a memory from this summer. Here Cavaliers members (from left) Tommy Mueller ('07, '08), Jordan Fillingham ('07. 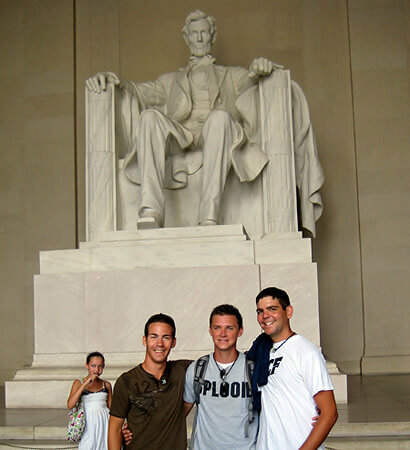 '08), and Ryan Sirmeyer ('05,'06,'08), are pictured at the Lincoln Memorial in Washington, D.C. We were fortunate enough to have a "free-day" in our nation's capital this past summer, and this was just one of the sites we saw. This experience added to an already memorable summer as the Cavaliers also celebrated a milestone too, our 60th anniversary.